If you do any of those aforementioned things, stop right now. These bad habits, along with many of the other unsanitary (and yet very common) habits listed below, can put you at risk of bacterial or fungal eye infection, which can lead to serious vision problems including permanent vision loss. Tap water contains microorganisms which can lead to infection or sight damage, and should never come in contact with your contact lens or contact lens case. 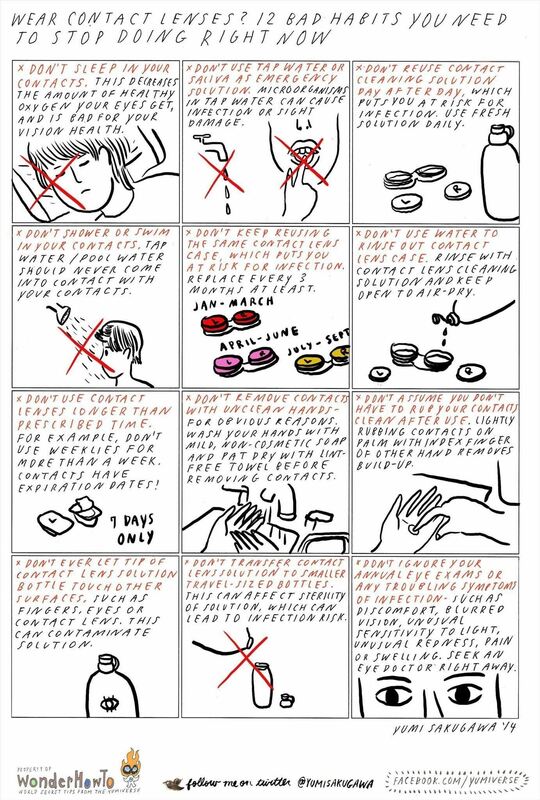 Reusing the same contact lens solution or reusing the same contact lens case after three months is simply unhygienic and puts you at greater risk for eye infection. Sleeping in your contacts cuts off oxygen from your eyes and is not good for your vision health, even if you're wearing "night and day" contacts.